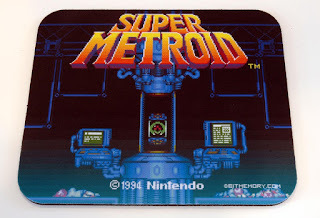 Back when I first started my blog I wrote about one of my favorite games, Super Metroid. I went back and read it, and did not think I put enough effort into that post, so I decided to write another one with more info. Having said that, in my opinion Super Metroid was the best game on the Super Nintendo. I know a lot of people will disagree with me, but as I said before, this in is my opinion. I would like to think that no one would argue that Super Metroid has at least got to be in the top five Super Nintendo games of all time. 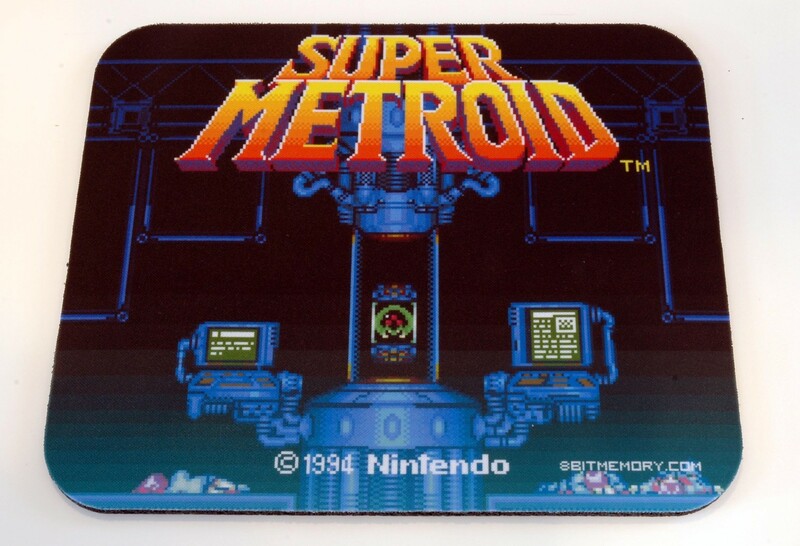 Super Metroid was released in North America April 18, 1994. Samus Aran is the main character as she was in Metroid her first game for the NES in 1986, and her second game Metroid II: Return Of Samus for the Game Boy in 1992. Super Metroid starts off right where Metroid II left off. Samus is doing a report on her first two mission. She reports that after a Metroid larva hatches, the first thing it sees is Samus. Being the first thing the Metroid saw, it thought that Samus was it’s mother. Samus collects the Metroid and brings it to Ceres Space Colony in hopes that the scientists could learn more about it. Samus leaves the space colony thinking all is well. Shortly after leaving she receive a distress call from Ceres and she head back. This is when you take control of Samus. When you arrive, you find all the scientists dead and the Metroid larva missing. As you search the colony, you find the larva in a back room. 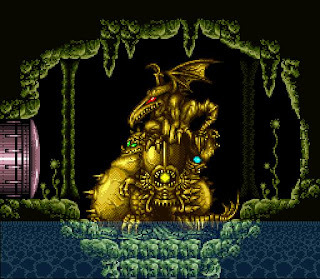 As soon as you go for the Larva, Samus’s old enemy Radley, the leader of the Space Pirates, appears and grabs the Metroid. After a quick battle Radley flees and Ceres Space Colony goes into a self-destruct mode. You now have to beat the count down and rush back to your ship. Once you get to the ship you escape the colony and follow Radley to the Space Pirate’s home planet, the planet Zebes. Zebes is a huge planet that has many different caverns that lead to different parts of the planet. You have to go into the caverns in a certain order. In each area you get power ups that will help you with the next. There are five main areas of the planet, Crateria, Brinstar, Maridia, Norfair, and Tourian. Each area has its own power ups along with mini-bosses and a main boss. And you need to defeat the four bosses to unlock the final area and get to the final boss. Even though Crateria is the surface of the planet, the first place you want to head to is Brinstar. Brinstar is made of a jungle and dry rock area. This area is also as the Space Pirates home base. You can find a lot of your starter power ups in this level including your first power up suit, Varia Suit. You also have to fight two mini-bosses, King Worm and Spore Spawn. After dealing with them and before you can finish out Brinstar, you need to defeat Kraid, the main boss. Kraid is a three-eyed green monster that is reptilian. All of his attacks are organic. He shoots spike from his belly and nails from his fingertips that are like boomerangs. He can also spit rocks from his mouth. Kraid is the one if the largest enemy’s you have to face. When you walk into the Kraid’s lair, all you can see is his feet. You need to jump up to a plate from that is in front of Kraid. As you are trying to do this you need to dodge his attacks. One trick you can pick up is when his eye’s turn red that means he is going to open his mouth to spit rocks. Right as he opens his mouth is when you need to attack. Now that you have the Varia Suit, you need to go through parts of Norfair next before you can get to the next boss area in Wracked Ship. In Norfair, a volanically-active area deep in the planet, you need to find the grappling beam. Even with the new suit you have, you can not go to every area of Norfair with out the Gravity Suit. So once you get what you can in Norfair you need to head back to Crateria where the Wracked Ship area is. Grappling across all the obstacles to get to the Wracked Ship is easy now. Once you get in the ship, everything is quite. No signs of life and a few dead bodies. You fight the boss of this area right away as this area is more obstacles and low enemies. The boss at Wracked Ship is Phantoon. Phantoon is a supernatural specter that is can go invisible. 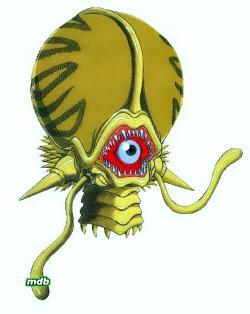 Phantoon looks like a giant squid with one eye that is in his mouth. He is invulnerable to all attacks when is eye is shut. He will float around invisible until he attacks. When he attacks, he will have flame like tear drops forum from his eye. They will spin around him and then spread out through the whole screen. You need to get inside of these flaming tear drops and hit him in the eye before he closes it and can not be attacked again. Once you defeat Phantoon and go through the level you find the Gravity Suit. Now you got the Gravity Suit I like to head to Maridia before heading back to Norfair. There are a couple power ups like the space jump you will need before you head back to Norfair. Maridia use to be apart of Bristar. But now is completely under water. The Gravity Suit comes in handy here too because you can not fully scout this area with out it. There is only one mini-boss in this area called Botwoon. The leader of this area is called Draygon. Draygon is a water born crustacean. Very large in size with a hard outer shell and a soft underbelly. Draygon looks like a he has a lobster tail, crab legs, with large round eyes and a round mouth filled with sharp teeth. Draygon hard shell has pointy spikes. Draygon will swim fast in and out of the screen when attacking. The first thing you need to do is shoot out the wall cannons. When you blow up the wall cannons they will spark. Now if Draygon grabs you he will smack you with his tail and do a lot of damage. When he does this switching to your grapple hook and shoot the sparking wall cannon. This will super charge Draygon and do a lot of damage. The best other way to attack him is to shoot his soft underbelly with missiles. Once Draygon is defeated a bunch of baby Draygon come in and drag him off. Now you need to head back to Norfair to finish that area off. With all the power ups you are now ready to take on Ridley. You just got to get pass the mini-boss Crocomire. Once your past him you can head for the main boss of Norfair. Ridley although beastly looking, is highly intelligent. 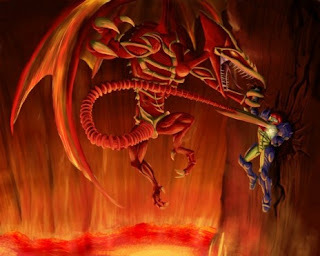 Ridley is like a skeletal pterodactyl with big yellow glowing eyes and red skin. He also has a long tail with a spear like tip that he will whip around and lunge at you with. As he flies around his lair he will also shoot fire balls at you. Once you take him out, the final area Tourian. When you get to the door to get to Tourian, there is a statue. The statue is of the four main bosses of Brinstar, Wrack Ship, Maridia, and Norfair. There is different color jewels in the eyes of each boss. One by one they shoot out and the statue falls through the floor. This is the way to Tourian and the final battle. Going through Tourian you run back into the Metroid larva. But it is not so small anymore. The Metroid has grown to a huge size. The Metroid attacks you and drains almost all your energy until it realizes that its Samus. The Metroid takes off and leaves you with low power. As soon as it leave, you re-charge and head out to find Mother Brain. When you find Mother Brain, the leader of the Space Pirates on planet Zebes, she is in cased in a glass tank. She is a huge brain with spikes and a giant eye that is closed. As you start the fight you have to brake the glass as you are getting shoot at by wall cannons and by beams from Mother Brain. Then the wall drop and you think you killed her. But no this battle is not over yet. The music changes and Mother Brain who you just though was brain in a glass, stands up and you find out not only is the fight still on, but Mother Brain is humongous with a full body. As Mother Brain walks back and fourth she shoots at you with round blue power rings and spits bombs. Every once in a wail she will charge up and hit you with extremely powerful laser beam that she shoots out her eye. This will do a whole lot of damage to you. After a few of those shots, you can no longer stand or defend yourself. 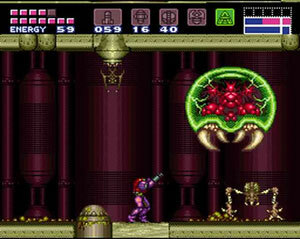 Right as Mother Brain charges up for the final blow, the huge Metroid returns and attacks Mother Brain. It starts draining all of Mother Brains energy making her start to turn to dust. Now that Mother Brain is down, the Metroid covers you. You think it is going to be attacking you when you realize that is is restoring your life. As the Metroid does this, Mother Brain get her strength back and starts attacking the Metroid. Right as it charges Mother Brain again, it dies and disintegrates on top of Samus. You are now back to full power plus some. You also have now have a super power cannon that you use to destroy Mother Brain for good! Now that Mother Brain is gone the planet goes into a self-destruct mode. Once you flee to your ship, you fly out to space as the planet explodes and the game ends. There was so much action in this game with challenging enemy’s and bosses. It had a great story and music that kept you wanting more. This is the reason why in my opinion, Super Metroid is the best game for the Super Nintendo.